An important tool we hope you never have to use! 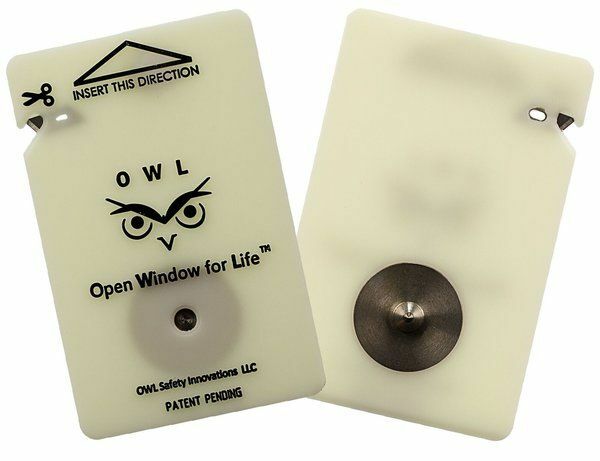 OWL Open Window for Life is a tool to help you escape your car in case of an emergency. This flat, credit card-sized gadget has a recessed razor to cut through your seatbelt and a side window breaking device. The patent pending design works easily and is 5 times more powerful than a spring loaded device. Simply slide the OWL card with the metal point towards the glass in the upper window channel as far as it goes, then with two fingers, pull the bottom of the card towards you and release. The pointed tip will hit the glass and break it outward, away from you. The OWL card is a must-have device that everyone should have in their car for those emergency situations.